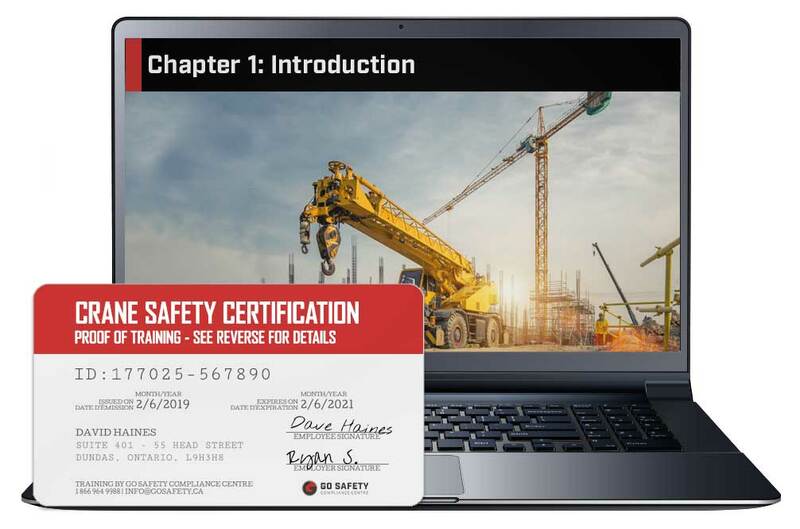 The Online Crane Safety Certification is designed for people who work with and around cranes on their job site. This course is intended to familiarize workers with various types of cranes, their hazards, and appropriate safety procedures for their use. Robert M. Verified Buyer The courses were thorough. We are definitely planning on using the site again. Joe C. Verified Buyer Easy online account setup, course access and certificate receipt. Jason H. Verified Buyer Great programs, very Interactive and easy to get through. I would recommend it to anybody. Michele Y. Verified Buyer Cost effective, User friendly, Easy to access and complete. Marc S. Verified Buyer I thought the content of the course was very good and the format is excellent. Thanks. Printable certificate is issued immediately upon successful course completion. Wallet-sized plastic certificates are also available. Training can be completed in two to three hours. Work at your own pace with no time limit. Individual training and bulk user management tools make coordinating training for multiple users quick and simple. Immediately upon the successful completion of the final exam, a digital certificate will be issued. This certificate can be downloaded from your account and printed at your convenience. Sign your certificate. There is room on the back to document any additional workplace-specific training. 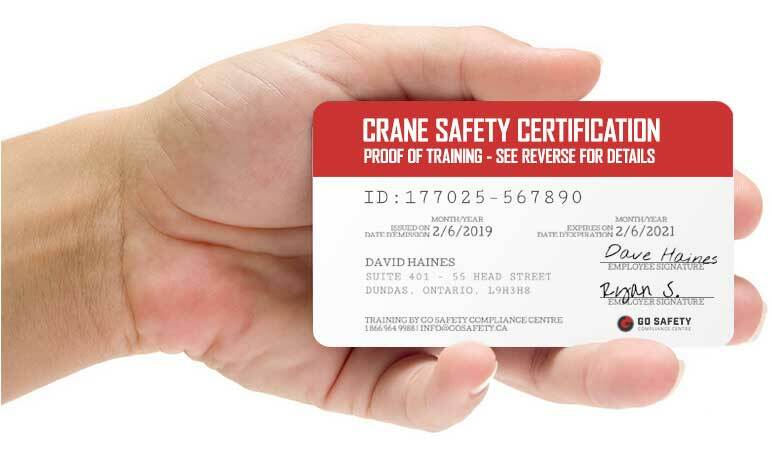 A sturdy plastic Crane Safety Certification wallet card may also be ordered directly from your Go Safety account for an additional fee. These hard-copy certificates are printed on durable 0.30mm polycarbonate plastic. WHO SHOULD TAKE CRANE SAFETY CERTIFICATION? Anyone who works on a job site where cranes are employed would benefit from crane safety training. This includes workers in the construction, manufacturing, oil & gas, transportation, and warehouse industries. WHAT TOPICS ARE COVERED IN THE CRANE SAFETY CERTIFICATION COURSE? The various types of cranes and their uses. WILL I REQUIRE ADDITIONAL TRAINING? Depending on the nature of your work, additional training may be required specific to your job site. Training is typically provided by the employer and must be delivered by a competent and qualified person. HOW LONG WILL IT TAKE FOR ME TO COMPLETE CRANE SAFETY TRAINING? Most students complete the course in a little over two hours, but there is no time limit. You can pause the program and pick up where you left off later. Once completed, the training material will continue to be accessible to you for review purposes. You can write the exam multiple times until you achieve the passing grade of 80%. WILL THE ONLINE CRANE SAFETY CERTIFICATION COURSE WORK ON MY TABLET OR SMARTPHONE? When you begin or continue your training on a mobile device, the website/application controls, and interface will automatically adjust for your screen size and optimize the controls for your device. HOW CAN I ACCESS MY CRANE SAFETY RECORD OF TRAINING? HOW CAN I PURCHASE A WALLET SIZED TRAINING CERTIFICATE? You can now purchase a wallet card version of your asbestos certificate online. Log into your account, go to Certifications, click then the green order button to the left of the certificate list. Select the course you would like to purchase the wallet card for and follow the prompts. WHAT HAPPENS IF I LOSE MY CRANE SAFETY CERTIFICATE? If you would like a plastic hard copy replacement delivered via mail or courier, you can order one online from your account with a small charge to cover the cost of postage, printing, and fulfillment. CAN I PURCHASE THE CRANE SAFETY CERTIFICATION COURSE FOR SOMEONE ELSE?